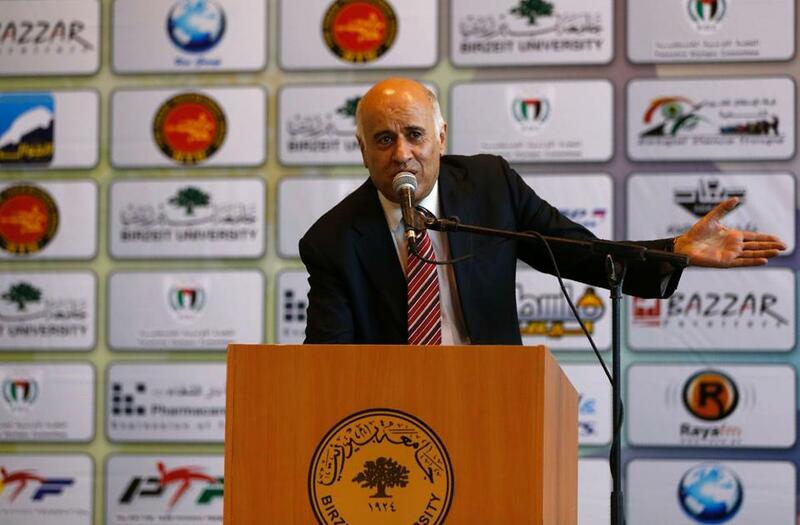 Palestine Olympic Committee chairman Jibril Rajoub spoke last month at the opening of the International Taekwondo Championships in Ramallah on the West Bank. Well, that’s one approach. Jibril Rajoub takes a somewhat different view. When the Peres Center for Peace hosted a soccer match between Palestinian and Israeli kids in 2014, the children enjoyed themselves immensely — “I love it when we play together like this,” 11-year-old Qusay, a Palestinian boy, told an AFP reporter. But Rajoub was furious. It was “a disgrace to use sports for this purpose,” he thundered, and issued a “demand that all individuals and institutions distance themselves from such activities.” He was equally implacable when the president of the Barcelona Football Club, during a good-will tour of Israel and the Palestinian Authority, proposed a match between the renowned Spanish team and a squad of Israeli and Palestinian players. Rajoub’s unsleeping hostility toward Israel comes as no surprise — the man is a notorious PLO chieftain with a long record of extolling terror. Alas, he is also the chairman of the Palestine Olympic Committee. And he has consistently exploited his position within the Olympic movement to glorify violence and to prevent attempts to connect Israelis and Palestinians through sports. Such behavior isn’t only hateful and immoral. It’s also an egregious violation of International Olympic Committee rules. The IOC’s detailed Code of Ethics requires Olympic personnel to respect at all times the movement’s principle of “universality and political neutrality” and to affirm “the Olympic spirit, which requires mutual understanding with a spirit of friendship, solidarity, and fair play.” Rajoub brazenly flouts those requirements, invoking his status as chairman of a national Olympic committee as he debases Olympic ideals. In a new report, Palestinian Media Watch, a private media watchdog, has documented multiple examples of Rajoub’s praise for terrorism and incitement to murder. The report shows that Rajoub has not simply glorified Palestinian “martyrs” (suicide bombers or gunmen killed during attacks on Israelis), but has done so explicitly in his capacity as an Olympic official. In its 24-page dossier, the watchdog group compiles numerous such cases of Rajoub honoring terrorists, with official Palestinian media identifying him again and again as the chairman of the Palestine Olympic Committee. Especially appalling was his attendance at a boxing match named in honor of Ali Hassan Salameh, one of the masterminds of Black September, the Fatah terror subgroup that slaughtered 11 Israeli athletes during the 1972 Summer Olympics in Munich. Like most ideals, the Olympic mission — the promotion of peace and dignity through sport — is an aspiration not yet achieved. The Olympic Games do not resolve international conflicts. The Olympic charter hasn’t deterred tyrants from abusing human rights. Nothing the International Olympic Committee does or doesn’t do will establish peace in the Middle East. But Palestinian athletes deserve a better leader than Rajoub, a man so toxic with hatred that he applauds terror attacks and denounces games that bring Arab and Jewish kids together. At the opening ceremonies in Rio de Janeiro this week, the Olympic Hymn will be sung: “Let all the flags of every land/in brotherhood unfold.” If the IOC cannot produce universal brotherhood, can’t it at least insist on a decent chairman for the Palestine Olympic Committee?